The D-Ring provides a creative solution for adding individual D-Rings to a rack or on a wall using appropriate fasteners. For optimal performance, do not exceed a 50% fill rate when passing cables through cable rings. Constructed from 16-gauge steel, and finished in a durable black powder coat. -Cable rings shall be filled using a recommended 50% fill rate, accommodating up to 120 CAT5e cables. 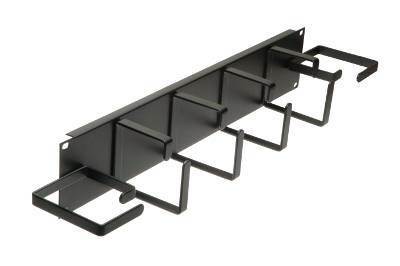 -Constructed with 16-gauge steel panel and finished in a durable flat black powder coat. -Indoor Air Quality Certified for Children and Schools.